There are so many ways you can set up a coffee bar at home, you can use your kitchen counter, a cabinet or a rolling cart! Time to be inspired! If you are a coffee lover then one of the best things you can do when organizing your kitchen is set up a home coffee station. By having everything you need to prepare your coffee all in one place you’ll save yourself time in the morning. And you’ll probably save money too since you’ll be less likely to pick up take out coffee on the way to work if you’re running late! 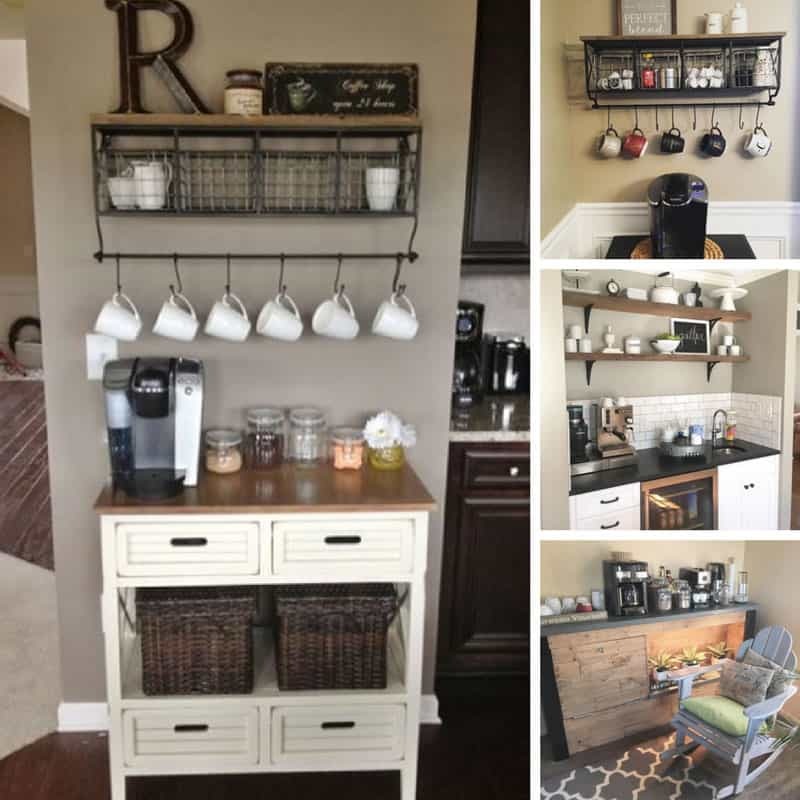 There are so many ways you can set up a coffee bar at home, you can use your kitchen counter, a cabinet, a rolling cart or even have a coffee bar custom built! You probably have all your coffee making equipment and accessories on the counter and in a cabinet already. The key to creating a coffee station is to group all the items together. So you might have your coffee machine out on the counter, and then in the cabinet above you can keep all your mugs, cups, spoons and of course coffee beans, grinds and other vital ingredients. If you have friends over for coffee regularly you might want to put all your coffee making necessities on a rolling cart instead of in a cabinet. Whether you wheel it over to your island or out into the living area you’ll have everything you need in easy reach. Your friends will be impressed too! When you’re putting together your coffee bar don’t forget about the accessories. Think about glass jars for storing coffee beans and sugar, a serving tray if you’re not having a trolley, and some pretty napkins. You might also want to add a milk frother, a bean grinder, and even some coffee art. If you’re going to have your very own coffee bar you’re going to want to impress your friends by serving up something other than your basic Americano right? These coffee recipe books will turn you into a Barista in no time! I had a lot of fun over at Instagram gathering up some FABULOUS home coffee station ideas to inspire you. Check out the pictures below! If you have the room a sink and a fridge are perfect for your home coffee station! A vintage cabinet like this is the perfect mini station for non-coffee drinkers who have friends that do! Take an old dresser and work some coffee magic! A Kitchen Baking Station is a Must if You LOVE to Bake! Next PostNext 18 DIY Play Kitchens so Amazing You’ll Want to Cook in Them Yourself!